Wow. There are few books that manage to successfully tug at all your emotions - happiness, sadness, anger, affection, grief - and also engage your brain in such a way that you feel smarter after having read it. 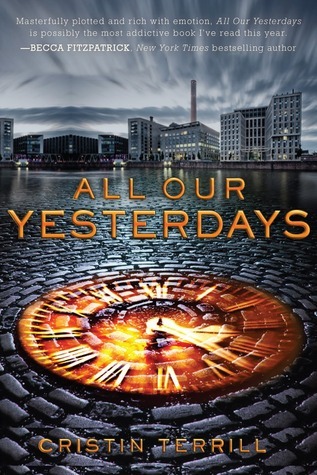 All Our Yesterdays is one of those books. The book is told from the alternating perspectives of two girls - Em and Marina. They are in two different time streams. Em is four years ahead of Marina. Their worlds slowly collide when Em goes back in time to stop events that Marina could never imagine. Em is the girl I immediately sympathized with. She has been tortured, watched her best friend Finn be tortured, she is hardened and desperate. She doesn't always make perfect decisions, but she's making them for what she believes to be right. Marina on the other hand is snooty, flighty, and selfish. She is easy to hate. But as the book goes on, she seems more pitiable than anything else - innocent, starry-eyed, ignored by her parents. I loved having both their perspectives to learn from; plus it was necessary for the plot. This is not a book that uses time travel as a trope but only lightly glosses over it. Time travel is at the heart of this novel. It is complicated with numerous discussions of paradoxes, personal time lines, etc. A year ago the heavy time travel aspect may have scared me off. But since I've become a die-hard Doctor Who fan, I understood a lot of the theory. I wonder if Cristin Terrill is also a Doctor Who fan. The main villain is called "the doctor" (although the TV Doctor is a hero) and the time travel project is even called Cassandra (the name of a memorable character in Series 1 and 2 of New Who). I'm not suggesting that the ideas are copied from Doctor Who. Apart from a few similar names and the basic time concept, this book has nothing in common with the show. Please don't avoid this book if science fiction or time travel is something you don't normally read. The time travel concept is quite logical. And even if you don't want to spend time wrapping your head around it, you can still love the book for the strong character drama and plot full of dangerous action. Love is a central theme in this book. Love of family. Love of intelligence. Childhood crushes. The "love" I most enjoyed was the strong relationship between two characters who'd done so much together and were willing to die for each other. It felt more important than the typical love-dovey kissy-kissy teen romances you usually read. The book flows very quickly once you get comfortable in the sci fi world. Em is tasked with killing someone. We don't know exactly who, but it becomes clear pretty quickly. It feels like no one is safe. From the evil doctor or perhaps from Em. I loved how many twists and turns it took. All Our Yesterdays is different from most books you read. It takes chances and succeeds. It give you three dimensional heroes and villains. Good people doing hard things and bad people whose choices kinda make sense even though they're horrible. I really can't recommend this book enough. This book was wild, wasn't it? I wasn't expecting what it gave me but I was happy when it came my way (and conflicted and scared and all the emotions that Em was feeling). Oh so glad you enjoyed it! It's currently sitting on my nightstand with the attention of being read but I haven't had the chance yet. Hope to change that soon. This was probably one of my favorite debuts this year ! I know Terrill is a Dr. Who fan so I wonder if the references where homages ? Well if you liked this book that much, I must read it as well. Awesome review. Wow, no other review for this one so far has made me want to read this one as much as your review has right now. This sounds fantastic! I love the idea that it's a book that will make you feel smarter for having read it. And I LOVE time travel! Thankfully I love science fiction as well as fantasy so I definitely plan to read this one! This is one book that you will not want to put down from the very first page and will leave you feeling bereft and at a loss as what to read next.